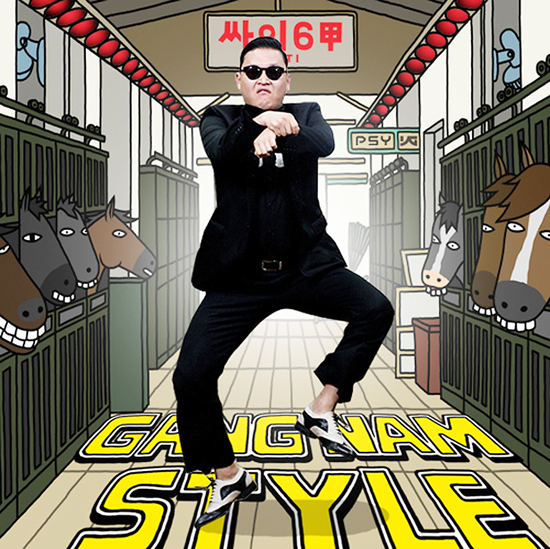 INTO THE NEXT STAGE: Do I Really Have to Talk About ‘Gangnam Style’? You are at:Home»English»INTO THE NEXT STAGE: Do I Really Have to Talk About ‘Gangnam Style’? By GUY AOKI Originally printed on Thursday, Sept. 20, 2012. OK, so I resisted it as long as I could. I was annoyed by people posting videos of “Gangnam Style” by some Korean artist. Annoyed because “Gangnam” is pretty darn hard to pronounce and Facebookers aren’t known for explaining what it is they’re posting nor their significance (for that, you have to go to Wikipedia, which I eventually did!). But when a younger member of MANAA asked me to raise the popularity of this song at this Thursday night’s meeting, I knew I had to do some research into the matter. So here’s the basic information: The song’s written and recorded by a 34-year-old South Korean rapper named PSY (Park Jae-sang), who’s been making albums for 11 years but only making the charts in his home country the last two years. PSY can communicate in English as he attended Boston University and the Berklee School of Music. According to Wikipedia, the title of the song “refers to a luxurious lifestyle associated with the Gangnam district, an affluent area of Seoul.” People apparently like his “unusual dance moves” and the insistent (I say monotonous), high-tech beat. The guy’s not exactly Tom Cruise. He’s got a chubby, flat face with eyes hidden behind sunglasses. He dances around in a business suit half the time like he’s whooping up an audience a la Arsenio Hall and the other half as if he’s riding a horse. Since being uploaded to YouTube on July 15, the music video’s received more than 216 million views. Yeah. 216 million! Even a video showing various teenagers reacting to the video has received more than 10 million hits. On Billboard Magazine’s “Social 50” chart, which measures popularity of artists online, PSY even beat out usual suspects Taylor Swift, Rhianna, and Katy Perry for the #1 spot two weeks in a row. This week, all of that interest translated to “Gangnam Style” making a #64 debut on the Hot 100 singles chart (only one other act from South Korea has made the American chart: “Nobody” by Wonder Girls peaked at #76 in 2009). We’ll see it all this online attention actually translates to sales (Rebecca Black’s “Friday” didn’t; despite the video’s 39 million hits on YouTube, the song never reached the Top 40). OK, my take on all this: I don’t see what the big deal is. We’ve seen these moves before. The one where he looks like he’s trying to lasso a horse and high-steps with both legs? John Travolta and Olivia Newton-John did the same thing in “Grease,” which came out in 1978 … and was a tribute to the 1950s! The hook, though monotonous as a lot of today’s music is, is catchy, and the artist performs with a confident swagger, which counts for a lot. But a stocky Korean dancing aggressively is a large part of the song’s novelty and popularity (I hate to make this comparison, but in a similar way, William Hung’s short-lived popularity was based on the same reason: expectations of the Asian male). Overall, PSY’s popularity is good: Anything that any Asian person (foreign or American) creates that entertains people of all races is positive because it transfers popularity to people of that ethnicity. So if some Americans are fearful of the crazy dictator in North Korea and wouldn’t mind seeing him taken out, well, let’s not be so quick to paint all Koreans with the same brush: This PSY guy is pretty hip! OK, so now you know. Now will your kids turn off that loud, annoying “music” and get off my front lawn?! Well, space had nothing to do with my not mentioning that TV series; I’d never heard of it until now! I did some research, and it was a sitcom that ran for one season between 1964 and 1965. You’re right, he was second-billed, behind Tony Franciosa, and played a con artist. That large role was quite a “get” back then. Why Should We Celebrate? Department: Some think it’s a big deal that we’ve passed the 40th anniversary of the beginning of the “M*A*S*H” TV series. I always thought it was overrated. While historians will assert it made sharp commentary on the Korean War, I must’ve missed most of those episodes. I just remember Alan Alda as “Hawkeye” Pierce annoyingly babbling on and on and on and on until I wanted to change the channel. I do recall gathering around the television set at UH Manoa as my friends (who were huge fans of the show) watched its last episode in 1983. And yes, it was very well done. But from an Asian American perspective, it was an all-white cast (not even a token black guy) and no Asian American regulars for a show set in Korea for 11 years. Pfah! Pleasant Surprise Department: Sorry if I gave out the wrong day for the finale for Fox’s “Master Chef” (it originally ran on Mondays and Tuesdays, then after the Olympics, cut back to just Tuesdays, but the finale ran on a Monday; go figure). As I said last time, I predicted blind contestant Christine Ha would beat black contestant Josh, but in the final show when each had to concoct an appetizer, entree, and desert of their choice, it seemed as if Josh was winning over the judges in two of the categories. They also felt he was more ambitious and Ha was playing it safe with simpler ingredients (though, as usual, they praised the amazing taste of her dishes). In the end, though they didn’t give a breakdown of who won in each category, they declared our girl the winner. Her cookbook of personal recipes is now in bookstores. 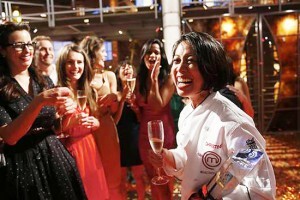 Thank you, Ms. Ha, for inspiring people across the country with your determination, talent, and loveable personality. Never thought I’d get emotional over a cooking competition, but I did because of you. 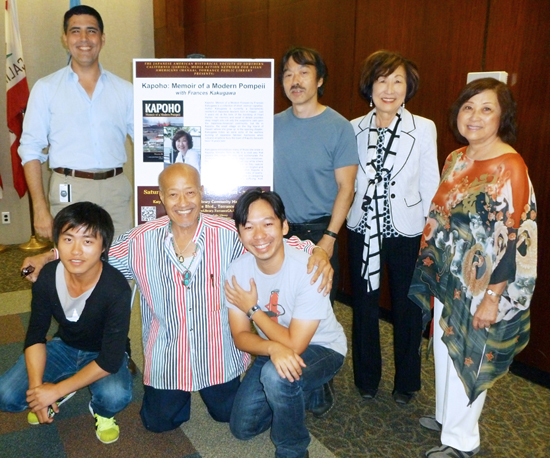 Arigato Department: I was pleasantly surprised with the turnout for poet/author Frances Kakugawa’s book reading/signing at the Torrance Library this past Saturday. Organizer Dana Vinke predicted between 50-100 people but he had to keep bringing in more chairs, and I counted at least 120 people (he thought it was closer to 140). My aunty was promoting her latest, “Kapoho: Memoir of a Modern Pompeii,” which recounts growing up in the small Hawaii town that was later covered by lava, and of her work in helping relieve the stress of caregivers by writing poems about their experiences. I couldn’t believe three of those in attendance were Kapoho natives! I had no idea of the proportion of attendees to those who actually decide to buy books, but about half the audience apparently did, as many bought multiple books. We ran out of “Kapoho” half way through, and Kakugawa had to take down addresses so she could mail books to interested parties and have them pay her later. Standing, from right: Torrance Library’s Dana Vinke, Guy Aoki, Frances Kakugawa, JAHSSC’s Iku Kiriyama; bottom row: MANAA members Zhan Geng, Aki Aleong, and Johnny Lam. If you want to get a sense of how it went, watch “This Week in Torrance” on Torrance City cable Channel 3 (it’s also on YouTube) beginning this Thursday for a week. Thanks to Vinke and JAHSSC’s Iku Kiriyama for all their hard work in promoting this event. “So much pride and love on their faces. Short of sounding egotistical, I’m so pleased that my book is giving Kapoho back to them. Most of these people are in their late 80s and 90s. I sent an email to Watermark Publishing soon after Torrance to thank them for giving Kapoho back to the displaced. That it has become more than a book. “It was also humbling to see so many Hawaii people in attendance. My only regret is I didn’t have time to speak personally to each person. Hopefully, the book will do this for me. If you missed her the first time, you can catch Frances at the Japanese American National Museum (100 N. Central Av. in Little Tokyo) on Saturday, Sept. 29, from 2-4 p.m. For more info, email me at [email protected] or call the museum at (213) 625-0414. Kellye Nakahara was a regular on M*A*S*H for a number of years, and in fact appeared in every season, even having her character be the focus of one episode during the final season. Oh, and by the way, “Gangnam Style” is now sitting at #11 on the Billboard Hot 100. Not the K-pop 100 (where it’s now #4 on the way down after being at the top for five weeks) but the Hot 100, thus making it a US Top 20 hit. Thanks for the chart update, Scott. I saw that myself–woah! Kellye appeared in a lot of episodes but her name was never in the opening credits with the regulars, so I don’t count her. Doesn’t that say a lot? 11 years and she finally gets an episode about her in that 11th year? I am not a frequent reader of your column, but something caught my eye regarding the Letters Department in the Rafu Shimpo we received today, that is your remarks regarding Jack Soo. You know Barney Miller was a hit comedy series and receiving many awards during it’s run. He (Soo) died during the 5th season and was given a loving send off by his cast members. He also is one of those JAs who change his name so that he could work in the entertainment industry after the war. 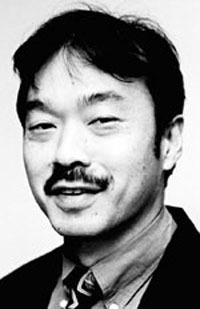 (WW2) He worked as a standup comic, changing his name from Goro Suzuki to that of Soo. Check his bio out and you will find that he crossed films and TV. Valentine, being a series I didn’t know about. On a personal note when Barney Miller was on, I watched because it was funny and Det. Sgt. Nick Yemana (Soo) was an integral part of the comedy and drama mix. The casting of a JA was quite a treat for Japanese Americans like me. I did not read your original article so I didn’t know if you mentioned Yuki Shimoda, if not, he is also someone else to read about. I know you are an advocate for Asian Americans, I applaud you for your efforts. By the way I agree with your comment (as presented in the article) regarding Mindy Kaling, I also do not find her particularly attractive (if that is what your wrote). My only criticism seem to revolve around your knowledge and or understanding of the JA community. Your use of the word “get” slighted the contribution Jack Soo had for the JA community and I took umbrage with it. You seemed to have denigrated his memory and accomplishments. Please in the future be a bit more generous in your research. Thank you. Regardless of your ability to twist words to your own favor, let me say this regarding your column today. You took the word “get” that I used out of context. The context is that what I was pointing out is that you slighted his other accomplishments. For the record i didn’t even know he was in the Valentine series mentioned. Your words, “Well, space had nothing to do with my not mentioning that TV series; I’d never heard of it until now! I did some research, and it was a sitcom that ran for one season between 1964 and 1965. You’re right, he was second-billed, behind Tony Franciosa, and played a con artist. That large role was quite a “get” back then.” My emphasis was not on Valentine but rather Barney Miller, which you didn’t mention. I did say I never heard of Valentine myself, but knew of his other accomplishments. Earl Barret who wrote the first letter made mention of that but you didn’t respond to the Barney Miller reference, only the Valentine. Barney Miller was Jack Soo’s last gig. If I erred and it was verified, I would be the first to apologize, I believe you misrepresented my intent and words. You are of the media, please police yourself. Now if I misread your intent, then I apologize, this is to clarify my position on the matter. A position which was not represented in your column. As for “get” I simply took it for getting something, nothing more.